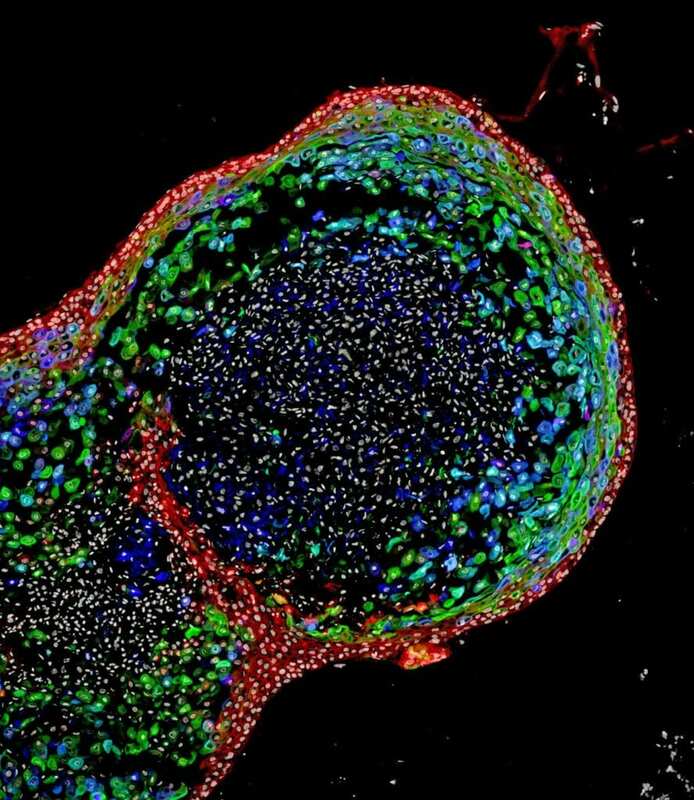 CINCINNATI – Scientists working to bioengineer the entire human gastrointestinal system in a laboratory now report using pluripotent stem cells to grow human esophageal organoids. The esophagus is a muscular tube that actively passes food from the mouth to the stomach. The organ can be affected by congenital diseases, such as esophageal atresia–a narrowing or malformation of the esophagus caused by genetic mutations. Additionally, there are several diseases that can afflict people later in life. Some include esophageal cancer, gastroesophageal reflux disease (GERD), or a rare ailment called achalasia–a disease affecting the muscles of the lower esophagus that prevents contraction of the organ and the passage of food. All of the conditions need better treatments, researchers note. This requires a more precise understanding of the genetic and biochemical mechanisms behind their cause–a need filled by the ability to generate and study robust, functional, genetically matched models of human esophageal tissue that can be grown from a person's own cells. The scientists based their new method for using human PSCs to general esophageal organoids on precisely timed, step-by-step manipulations of genetic and biochemical signals that pattern and form embryonic endoderm and foregut tissues. They focused in part on the gene Sox2 and its associated protein–which are already known to trigger esophageal conditions when their function is disrupted. –The scientists used mice, frogs and human tissue cultures to identify other genes and molecular pathways regulated by Sox2 during esophagus formation. In another test to help confirm the importance of Sox2 expression on esophageal formation, researchers studied the complete loss of Sox2 during the development process in mice. The absence of Sox2 resulted in esophageal agenesis–a condition in which the esophagus terminates in a pouch and does not connect to the stomach. After successfully generating fully formed human esophageal organoids–which grew to a length of about 300-800 micrometers in about two months–the bioengineered tissues were compared biochemically to esophageal tissues from patient biopsies. Those tests showed the bioengineered and biopsies tissues were strikingly similar in composition, according to the authors. Billions of gallons of water saved by thinning forests.